When GuideWell awarded its foodservice contract to FLIK Hospitality Group last fall, the switch set in motion a few changes for cafes at the company’s Florida Blue division, headquartered in Jacksonville, Fla. The new management company floated a number of ideas to modernize the insurer’s employee cafes, including a guest restaurant program. 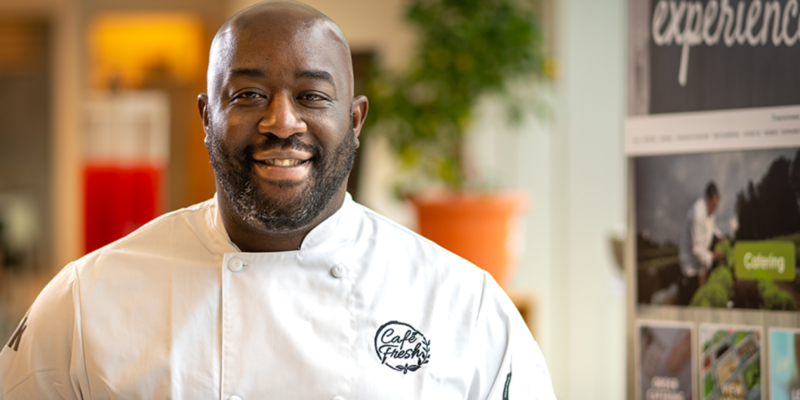 Damian Monticello, Florida Blue’s senior director of hospitality services, suggested local restaurateur and “Top Chef” alumnus Kenny Gilbert as a natural fit for a guest restaurant appearance. His eateries, Gilbert’s Underground Kitchen and Gilbert’s Social, already had a loyal following, and Monticello and Gilbert had stayed in touch over the years after working together at Ritz Carlton. “Our initial meeting with FLIK led to additional conversations around Kenny’s approach to food, what we were trying to do for our employees and FLIK’s approach to food,” Monticello says. “And we quickly realized there was something more substantial there.” So, instead of a guest restaurant appearance, FLIK brought Gilbert on as executive chef for the GuideWell account. FLIK’s plan for Florida Blue involved whole ingredients, scratch-made soups and stocks, fresh produce and a focus on wellness. Gilbert added the local flair. “We researched the demographics of the employees and came up with a cycle of different menus every day linked to that,” Gilbert says. The result is a concept called Café Fresh, envisioned as a food hall-style eatery with something for a wide variety of tastes. Each weekday spotlights a different ethnic theme—Indian, Italian, Asian, Latin and Caribbean—linked to the makeup of the 7,000-strong workforce at Florida Blue’s Jacksonville headquarters. On Indian day, the hot bar presents curries, healthy grains other Indian specialties, while other stations feature the standard daily menu alongside items like a curried chicken wrap with mango chutney or a grilled chicken breast with tandoori marinade. Regular stations serving Italian specialties and wings, a grille, a griddle and a huge salad bar were built into the facility as well. Additional Café Fresh locations under development in a different building on the Jacksonville campus and at other GuideWell and Florida Blue sites will offer menus reflecting local food trends and preferences. To kick off the new direction and introduce Gilbert at Florida Blue headquarters, FLIK organized a weeklong outdoor barbecue. FLIK had already scheduled a smoked food truck for the site, so Gilbert simply took advantage of the smoker to finish off his brand of barbecue. 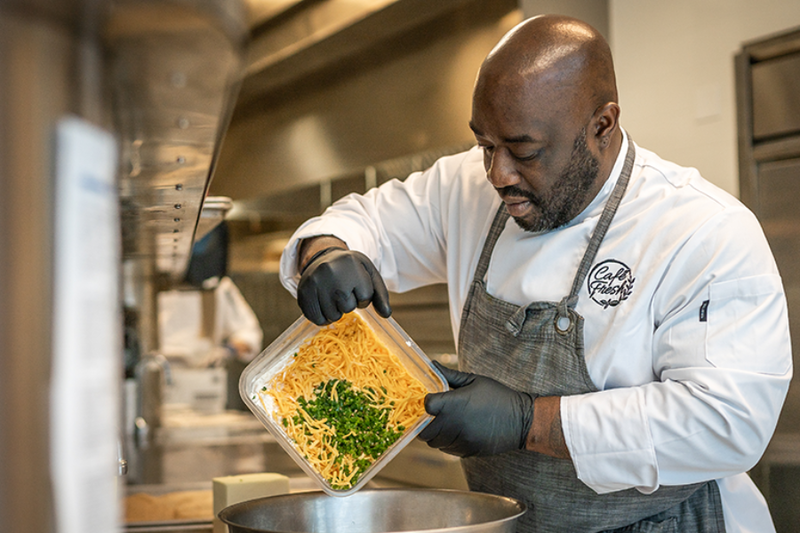 Following that, a team from one of Gilbert’s restaurants started a regular, three-day-a-week gig at the café, serving barbecued brisket, pulled pork, turkey and rotating Southern-style sides at one of the stations. Reception to the new global approach has been warm; café traffic has picked up in the short time it has been in place. Gilbert plans to rotate in new cuisines on a regular basis to keep selections fresh. Indian day will probably stick, thanks to demand from a large contingent of Indian staff members, but themes like Moroccan or Mediterranean are on the horizon. “Being able to showcase that we identify with the community is smart. But at the same time, we have to switch it out,” he notes. More guest restaurants are planned as well, with local chefs doing popups at one of the Café Fresh stations one or two days a week. “We’re leaning on Kenny’s network of other chefs in the area who would be interested in having a station here once our second café opens,” Monticello says. Florida Blue has hosted a mix of local operators and national chains as guest restaurants already, but the focus now will be strictly local in an effort to support area businesses. Bringing in outside providers helps keep employees on site at lunchtime, but it’s also good citizenship. “It’s a way to feed our employees and gives the restaurants an opportunity to showcase their menus,” he adds. This article first appeared in Food Management Magazine on March 7, 2019.